Seeing [my] artwork around the world makes me very proud and proud to be Inuit. Born on September 6, 1951 in Puvirnituq, Aisa Amittu comes from a large family of artists. His father, Davidialuk Alasua Amittu, and his father’s cousin Joe Talirunili are two of the most celebrated artists to come from the North. His brother Johnny Amittuk and his cousin James Amittu are also carvers. 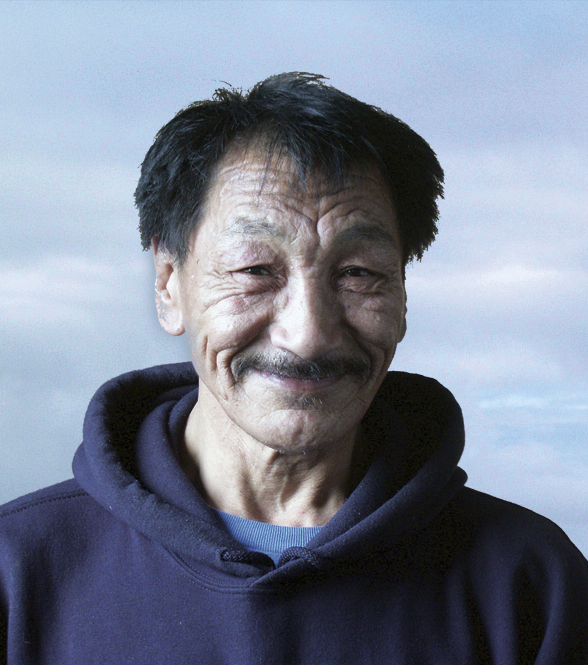 Amittu spent many of his formative years in Puvirnituq, but moved to Akulivik in the 1990s. Inspired by his prolific father, Amittu began to carve as a young boy. He was greatly influenced by the old stories, as retold by his father, and has sought to portray these legends in his work from the onset of his career. Although Amittu is best known for his stone sculptures, mainly carved from the dark stone found around Akulivik and Puvirnituq, he has also experimented with materials such as ivory and antler. Amittu has also tried his hand at two-dimensional pieces and produced several linocut prints that were included in the annual Puvirnituq print release in 1989. Additionally, he created several unique collage pieces, such as the one featured in Nunavimiut: Art Inuit (published by Avataq Cultural Institute, 1992). Like many artists from Puvirnituq, Amittu often recreates scenes from well known legends and myths. His father, Davidialuk, and his father’s cousin Joe Talirunili were known for their storytelling abilities and Amittu carries on this tradition through his carvings. Not wanting to be confined to a particular theme, Amittu also enjoys experimenting with different subject matter and has portrayed imagery not usually associated with Inuit art. While in Ottawa attending the Inuit Art Foundation’s Nunavik Carvers Symposium (1998), he carved an impressive elephant simply because he “always wanted to carve an elephant” (1999: 52). Amittu’s work has been shown in solo and group exhibitions in Belgium, Germany, France, New York, and Spain. His pieces are included in national public collections such as those at the Canadian Museum of Civilization, the National Gallery of Canada, and the Winnipeg Art Gallery, to name but a few. Amittu’s first carving was of a standing figure, with which he was very pleased. “I’ve never forgotten it to this day,” he says. His early work as an adult also focussed on figurative compositions, often featuring characters from myths such as the Kajjutajuk — a creature that was essentially a “human head, tattooed, and with breasts for cheeks” (Myers 1977: 17). Among countless other stories, such as The Dwarf Who Smothered a Man and Northern Lights, Amittu continues to portray elements of popular legends that are familiar to those throughout Nunavik. By the mid-to-late 1980s, Amittu’s work featured multiple figures and a much more complex use of negative space. Looking to his father’s body of work for inspiration, Amittu began to incorporate a hallmark of Davidialuk’s work into his own — namely an overarching spiral that connects various elements of the work and is thought to represent the aurora borealis. Amittu continues to revisit and rework previous themes. At first glance, his work from the 1990s-onward varies little from his previous work. Upon closer inspection, however, one notices more pronounced facial expressions, which serve to more readily convey the emotions associated with the story and not just the events of the story itself. Later in his career, Amittu also began to depict hunting scenes and to work more often with bone and ivory. His most recent pieces often incorporate stone with both of these materials, demonstrating his skill as an accomplished, mature artist. Although Amittu began to carve at the age of 12, his work was not publicly exhibited until 1981, when it was included in the group show, Arctic Quebec Sculpture at Houston North Gallery in Lunenburg, Nova Scotia. Largely self taught, Amittu has enjoyed a fruitful career which has spanned nearly five decades. His work has been featured in numerous group exhibitions in addition to many solo shows. Most recently, Amittu was commissioned to create a piece for Metamorphosis: Eleven Artists from Nunavik, exhibited at the Canadian Guild of Crafts in Montreal in 2006, in celebration of the Guild’s 100th anniversary. 1988, Povungnituk 1988–89: with retrospective collection 1977–1987. Montreal: La Fédération des Coopératives du Nouveau-Québec. Inuit Art Quarterly, 1999, “I Always Wanted to Make an Elephant,” Inuit Art Quarterly (IAQ), vol. 14, no. 1 (Spring): 52. 1977, Davidialuk 1977. Montreal : La Fédération des Coopératives du Nouveau-Québec. 2006, “Metamorphosis: Eleven Artists from Nunavik,” Inuit Art Quarterly (IAQ), vol. 21, no. 3 (Fall):30–34.